The government shut down early Saturday, January 20th after Congress failed to agree on a funding bill. That triggered automatic furloughs for government employees deemed “non-essential.” That means only a portion of each federal agency’s employees will continue to work through the shutdown. The Treasury and IRS have the option to reassess how many people they need working and what functions may be performed. If the IRS is confronted by a lapse in appropriations during the 2018 Tax Filing Season (January 1 – April 30, 2018) the IRS will need to continue return processing activities to the extent necessary to protect Government property, which includes tax revenue, and maintains the integrity of the federal tax collection process, along with certain other activities authorized under the Anti-Deficiency Act. 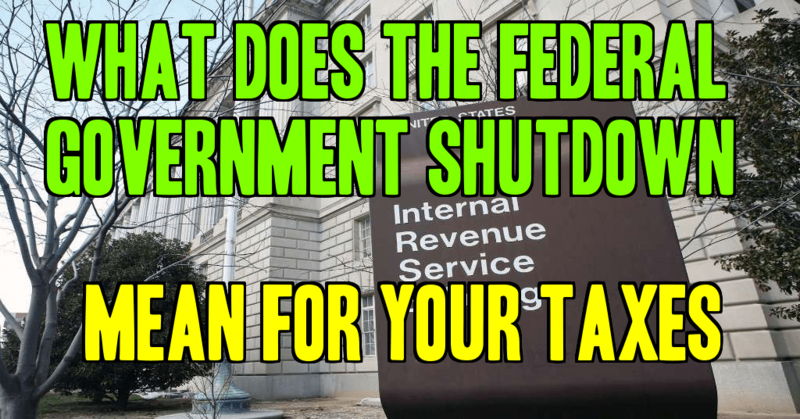 The contingency plan gives examples of the IRS functions that will continue throughout the shutdown. They include processing electronic returns, testing upcoming filing year programs, and computer operations to prevent the loss of data. You may find it useful to keep a list of IRS operations that are still in effect, modified, or unavailable during a period of a government shutdown. Tax Deadlines – Unfortunately, taxes are still collected as usual despite government services being limited. Do not skip your deadlines or regular obligatory payments because you will be penalized and interest will be charged once things are up and running again. Electronic Filing – The e-file tool will not only still be available, but in fact, the IRS prefers electronic filing during a time of shutdown because this system is automatic and minimizes the manual workload. Automated IRS notices – You can still plan to receive notifications in the mail from the IRS during a government shutdown. The mailings are actually automatic services. Individual Transcripts – This service is automated and will still be in effect if requested through the automated tool on the IRS website. Automated Telephone Service – Most toll-free telephone applications will remain operational. This service may be modified from its existence under normal operations. Website – IRS.gov will still be up and running, although some interactive features will not be available. Paper Filing – Paper filing returns will still be in effect (the USPS will deliver and postmark accordingly) but the returns will not be processed until government operations resume normally. Enforcement Actions – Non-criminal actions will be taken on a limited basis, specifically those involving time-sensitive issues, for example, those involving statute of limitations, but other non-criminal actions will not be in effect during a time of shutdown. IRS Criminal Investigations employees will be working, and criminal action will still be in effect. Refunds – Refunds will not be paid during a government shutdown. Real Life Customer Service – Live telephone customer services assistance will not be available. Additionally, walk-in taxpayer assistance centers will be closed at this time. Audits, Appeals, Taxpayer Advocate Cases – These appointments should be treated as canceled. The IRS will reschedule these appointments after the shutdown has ended. Third Party Transcripts – This service is performed by IRS employees and will not be available until after the government shutdown has resumed. Levies or Liens – These impositions will not be issued or carried out during this time. Installment Agreements – Applications can be submitted, but approvals will not be made until after the government shutdown. You can file your tax return electronically or on paper — although the processing of paper returns will be delayed until full government operations resume. Payments accompanying paper tax returns will still be accepted as the IRS receives them. Taxpayers should continue to file and pay taxes during a lapse in appropriations as they would under normal government operations. Individuals who requested an extension of time to file should file their returns by October 15, 2018. Taxpayers can file their tax returns electronically or on paper. However, the processing of paper returns will be delayed until full government operations resume. Individuals and businesses should keep filing their tax returns and making deposits with the IRS, as they are required to do so by law. Taxpayers are urged to file electronically because most of these returns will be processed automatically. Payments accompanying electronic tax returns will be accepted as the IRS receives them, although the IRS will be unable to issue refunds during this time.